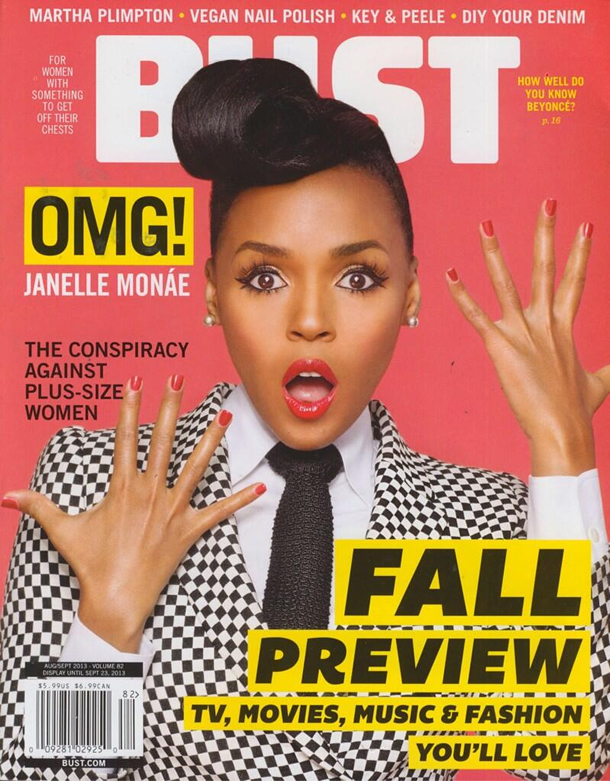 Janelle Monáe is the cover story of the August/September 2013 issue of BUST Magazine. Read the article on their website and check out the cover below. The 2013 MTV Video Music Awards nominees are out and Janelle Monáe picked up a nomination for her "Q.U.E.E.N." video in the Best Art Direction category. Other nominees include Capital Cities' "Safe and Sound," Third Second to Mars' "Up in the Air," Lana Del Ray's "National Anthem" and Alt-J's "Tesselate." You can now pre-order "The Electric Lady," Janelle Monáe's upcoming album, on iTunes. There are 19 tracks listed, though only two have titles. This doesn't mean the final release will have 19 tracks, though, as the track listing has yet to be released. CoverGirl has released a new promo for their Clean Whipped Creme Foundation featuring Janelle Monáe and her new single, "Dance Apocalyptic." Watch it above. Forbes recently released their annual ranking of the 100 most powerful celebrities, The Celebrity 100. Zack O'Malley Greenburg included Janelle Monáe in his list of three long term prospects to keep an eye out for future editions of the list. He notes that she is now grossing over $100,000 for a night on the road. Janelle Monáe has released the new music video for "Dance Apocalyptic." It was directed by Wendy Morgan based on a treatment written by Chuck Lightning. Monáe has released the treatment and you can read it care of Atlantic Records. At last night's BET Awards 2013, Janelle Monáe performed "Q.U.E.E.N." with Erykah Badu. Watch the performance below. Target has revealed that they will release an exclusive, deluxe edition of Janelle Monáe's upcoming album, "The Electric Lady," which will feature 4 bonus tracks. Those bonus tracks are "HYTB," "I Want You Back (Jackson 5 Cover)," "Q.U.E.E.N. (Remix)" and "The Electric Lady (Remix)." On July 2, Janelle Monáe will release a music video for "Dance Apocalyptic." Check out a teaser below. Janelle Monáe has released a video where she explains the meaning behind "The Electric Lady," the title of her upcoming album, due out on September 10.